I am so behind on updating this thing, it isn’t even funny. Life has just been hectic lately, and keeping up with everything is just impossible. I will try and recap all that has been going on in my knitting life though. The Mechanicsburg Knitting Group is doing well- we have new people joining every month, and they are all such great women. I look forward to those weekly get togethers! I am worried we may need to relocate though- we are currently meeting at a Panera, but if the group gets too much larger, I am afraid we may cause a bit of a disturbance. I can’t really think of anyplace else that would work for these meetings though. There aren’t a lot of places that like people sitting around for a few hours socializing (even though almost all of us at least buy a drink there). Project-wise, I finished the Log Cabin socks, and they are now waiting to be mailed out. I cast on the Riding to Avalon sweater, and am about 6″ into it. It is going well, and the Malabrigo silky merino is a good yarn for it- not too thick or heavy. The Cardigan for Arwen is coming along too. The right side is now over halfway done, with half the sleeve knit. I just needed to finish the sleeve, and do the hood. It will be so nice to finish this after over a year! Finally, the current project of Pride. The Marine Boy is a huge Ohio State fan (whereas my family is all die-hard Penn State fans) and wanted an Ohio State hat. Now first of all, going into any yarn store in central PA to buy scarlet and grey yarn? HA. But, I did (although the colors are off a bit. I showed him!) 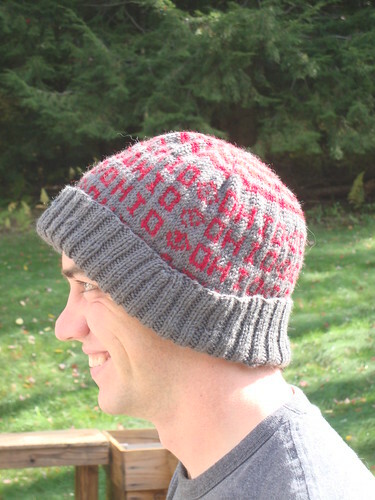 and I knit him the O-H-I-O hat pattern from Tuscan Grove. I added one repeat going around, since he has a bit of a large head, and because it was my first attempt at colorwork and I knew it was going to be knit pretty tight. 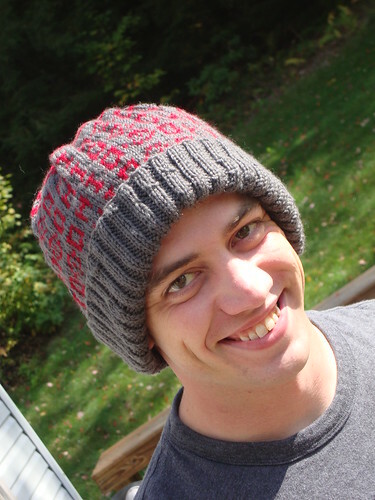 I finished it in just 10 days (pretty sure that is a record for me) and gave it to him in time for him to go wear it to the OSU/Wisconsin game this weekend. I think that is all for now. I am starting to get holiday knitting lined up, which is going to consist of a Penn State version of the hat for my brother, mittens for my grandmother, and hopefully a new sweater vest for me, with the yarn I bought!